This will be the eleventh annual gathering of the Association for Contemplative Mind in Higher Education (ACMHE). The ACMHE is a multidisciplinary academic association with a membership of educators, administrators, staff, students, researchers and other academic professionals committed to the transformation of higher education through the recovery and development of the contemplative dimensions of teaching, learning and knowing. 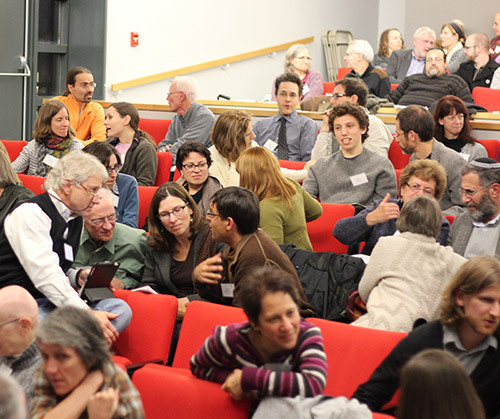 The ACMHE promotes the emergence of a broad culture of contemplation in the academy, connects a broad network of academic professionals with online resources, and stimulates scholarship and research concerning contemplative pedagogy, methodology and epistemology within and across disciplines through initiatives and events including the annual ACMHE conference. The ACMHE is an initiative of the Center for Contemplative Mind in Society, a 501-c(3) non-profit organization which works to integrate contemplative awareness and contemporary life in order to create a more just, compassionate, reflective, and sustainable society. For 20 years, the Center has fostered the inclusion of contemplative practice and inquiry in colleges and universities. Dues are self-selected and range from $35 to $125 per year. The ACMHE is funded by a combination of membership dues, event fees, and individual and foundation support. Member Directory. Our revamped member directory allows you to search by name, city, state, region, academic discipline, title, institution and special interest. Want to contact a member you met at a past ACMHE conference, or find others working in your field? Our directory may help. Syllabus archive. Offering examples of syllabi for courses that incorporate contemplative approaches, the syllabus archive is updated on an ongoing basis and is open for member submissions. Free access to The Journal of Contemplative Inquiry, the new online peer-reviewed journal dedicated to contemplative practices and perspectives in academia. Members also have the manuscript submission fee waived. Podcast series. Full episodes of the podcast series, offering lectures and conversations on contemplative practices and perspectives in higher education, are available only to ACMHE members. Connection with hundreds of ACMHE members across the world. We provide multiple ways for ACMHE members to share information: through an email discussion list, listing events on our public events calendar, and contributing announcements to the member newsletter.